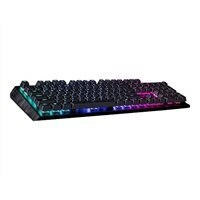 Cooler Master CK550 - Keyboard - USB - US - key switch: Gateron Red - Gunmetal blackGet a straightforward keyboard that performs well on the battlefield with the CK550 Gaming Keyboard. Mechanical switches rated for 50 million clicks will guarantee your keyboard will stay combat-ready during all your long-lasting skirmishes. On-the-Fly Controls allow customization of your settings like RGB lighting and macros in real time, while software lets you get even further customization. Simply put, the CK550 is a capable tool that gets the job done.